The Problem: Lockheed Martin was competing with Russia’s Sukhoi and Sweden’s Saab. Also the Thai government didn’t want to pay in cash, so it proposed paying with 80,000 tons of frozen chickens. The Role of U.S. Diplomats: They actually worked to promote the odd-ball deal since it A) helped Lockheed and B) kept the Russians from winning the deal. Incredibly, Lockheed indicated that it was “was willing to play ball” and accept chickens as payment. 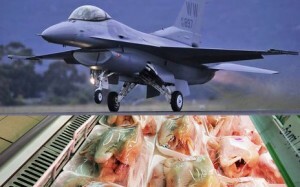 Nevertheless, the chickens-for-jets plan never panned out because the Thai regime was ousted in a military coup. « Grizzly+Polar=Grolar? Or Is That Pizzly? Posted on 03.08.11	to articles, photos. Subscribe to follow comments on this post. No comments yet. Add your thoughts or trackback from your own site.